Over the past 15 years I’ve helped run some of the largest Browns Backers locations in the country: Washington DC, Los Angeles and now as the President of the Union Square Browns Backers of NYC. Over that time, the Cleveland Browns have gone 82-170 and made the playoffs once (a Wildcard loss to the Steelers in 2002). During the 2016 Cavs championship run our Backers group hosted watch parties which regularly packed 650+ rabid Cleveland fans into our New York City viewing location. When the Tribe’s Postseason push brought us to Game 7 of the World Series we had the same diehard support, topping out at 600+ supporters. Our fans were so rowdy and so awesome that Budweiser caught wind of our exploits; they reached out and filmed a nationally televised commercial to capture our CLE fandom during Game 2 of the World Series. (Sadly, this never aired since the Cubs won…. #notmychampion). 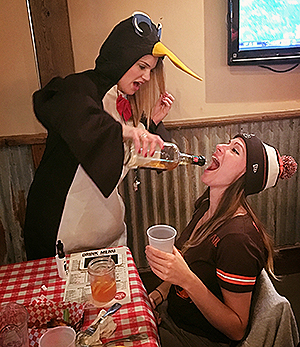 During Week 1 of this NFL season we had over 300 Backers show up to support the Browns, making us one of the top 3 largest Browns Backers locations worldwide. Can you guess how many fans were in attendance Week 12 of the Browns season, a game where our opponent punted 9 times in one game yet we still managed to lose by 14 points? Twelve people. Because the winless Cleveland Browns are a gaggle of incompetent clowns. They are an embarrassment on almost every level and are no longer watchable. They have let down their city and we the fans are tired of it. Did you know tickets for remaining home games can be scooped up on StubHub for a paltry $2 a pop? For the price of a stadium beer, you can literally buy four tickets to watch these jokers run around like a middle school football team. The Cleveland Browns have done nothing this season to earn our respect and certainly no longer deserve our support. Accordingly, we are officially closing our viewing site for the remainder of the season. If you’re reading this, don’t think for a minute that your Browns fanship or your Browns Backers chapter is more diehard than our group simply because you’re going through the motions every Sunday for the next 3 weeks. Let me be clear: this is not an act of indifference or defeatist behavior — this is an act of contempt and defiance towards the on and off-field product the Browns organization have put in front of us this season. As always, special thanks to the wonderful staff of Brother Jimmy’s Union Square for all their hard work and support every game day. And don’t worry about the Shot Penguin — she’s taken an early flight south for the winter. We’ll see all you Cleveland faithful this coming April for the Cavs playoff run.